Review Renu MPS Multi-Purpose Flight Pack Bought this for holiday and was quite useful and would recommend. Review Renu MPS Multi-Purpose Flight Pack Good carry-on version. 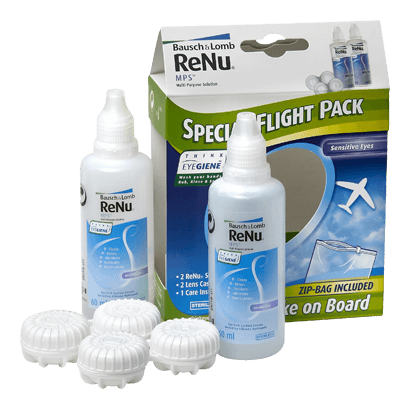 Review Renu MPS Multi-Purpose Flight Pack Good cleaning solution but could give a bit more moist to the lenses. Review Renu MPS Multi-Purpose Flight Pack Great value, good quality. Review Renu MPS Multi-Purpose Flight Pack Really useful product. Review Renu MPS Multi-Purpose Flight Pack Have bought this but not used it yet which is the only reason for average review. Exactly what it says on the tin for easy travel and arrives promptly. Review Renu MPS Multi-Purpose Flight Pack Super useful for when you're travelling. A little overpriced, but I guess you pay the comfort of having the small bottle. Review Renu MPS Multi-Purpose Flight Pack I ordered this for my upcoming trip. I am familiar with the product hence why I ordered it. It makes it easier to use my contact lenses during flights. Delivery was speedy. Review Renu MPS Multi-Purpose Flight Pack Total value for money and it even came with a resealable pouch! Review Renu MPS Multi-Purpose Flight Pack Perfect for travelling. Love this. Thank you. Review Renu MPS Multi-Purpose Flight Pack The best for traveling, but I find them very usefull. Review Renu MPS Multi-Purpose Flight Pack Great product but you're paying for convenience. Review Renu MPS Multi-Purpose Flight Pack Practical bottles for travelling people, the cases come in really handy as well! Will definitely buy more before travelling. Excellent travel pack! Great travel pack, I use this solution normally and travel a lot for work - so I find this flight pack is great for taking in my hand luggage. Review Renu MPS Multi-Purpose Flight Pack Nice small couple of bottles to carry in your hand luggage during your airplane journeys. Review Renu MPS Multi-Purpose Flight Pack ReNu Flight Pack was recommended to me by Visiondirect, as I only wear my contact lenses at the weekend, and was having to throw nearly full bottles cleaning solutions out every month. I find the flight packs much more economical. Review Renu MPS Multi-Purpose Flight Pack No problems with this product, but not very good value for me because I used it as an emergency pack if I wanted to take my lenses out during the day, for instance in order to go swimming. But once opened, the pack doesn't keep very long. If I had used it as intended, as a flight pack or for a few days away, I'm sure I would be buying it again. Review Renu MPS Multi-Purpose Flight Pack This flight pack is useful for it's size though the problem is that when taking luggage on board a flight & not in the hold it becomes less so due to restrictions. Though I find it very useful everyday as I always carry a bottle in my bag for any emergencies. Review Renu MPS Multi-Purpose Flight Pack Good quality and really handy size - you get 2 bottles, 2 cases and plastic bag - ideal to keep in drawer for overnight stays/weekends away. Review Renu MPS Multi-Purpose Flight Pack Perfect for trips or to carry in your handbag. Review Renu MPS Multi-Purpose Flight Pack Renu is a very useful everyday product and I always have a bottle in my handbag for days when my lenses get uncomfortable - or if I am going out in the evening and don't have time to go home. It is also very useful on a long flight when you need to take your lenses out, soak them then put them back in - Renu does all of that without the need for multiple solutions. Review Renu MPS Multi-Purpose Flight Pack My best friend if I go for vacation or stay overnight at my friends/relatives. Review Renu MPS Multi-Purpose Flight Pack Excellent value for money! Renu MPS Multi-Purpose Flight Pack Easy to use, doesn't take much room in my hand luggage and it doesn't dry out or irritate my eyes. Renu MPS Multi-Purpose Flight Pack This is a really good product to take in your hand luggage and it's very easy to use on a flight as well. Fantastic Very pleased with this product. I was searching for a small bottle of solution to take on a short business trip so it would fit in my plane hand luggage. Just the right amount of solution in these, and also comes with contact lens case which is handy. Great for holidays! Use this solution normally, but was pleased to discover you can buy in a small travel pack. Really good for holidays! if you want comfort with value for money-this is it! the solution provides comfortable wear all day long witout the need to rewet and it keeps your eyes fresh for longer. it is compact size which not all branded products provide. The Renu MPS Multi-Purpose Flight Pack makes travelling with your contact lenses easy. Produced by reliable vision experts Bausch and Lomb, this handy pack offers enough solution to keep your lenses clear without taking up too much room in your bag. The Renu MPS Multi-Purpose Flight Pack includes Bausch and Lomb's popular Renu MPS cleaning fluid, an all-in-one solution proven to effectively destroy germs and cleanse soft contact lenses. Intended to be used with all soft lenses (including silicone hydrogel), this solution will deliver superb vision and added comfort. The flight pack includes two 60ml bottles, a lens cases for safe storage and a useful clear, zip up bag so it can be easily brought in your hand luggage.